It's reigning cats and dogs: Pet Airways' Alyse Tognotti prepares a puppy passenger for his flight during a training session in Omaha, Neb. The fur was really flying today, but not because anyone had a bone to pick. Twelve "pawsengers" (also known as "cats and dogs") took off on the inaugural flight of Pet Airways from Long Island's Republic Airport in Farmingdale, N.Y. today. Five-year-old Sandy, a Golden Retriever, was among those onboard the flight from New York to Los Angeles -- headed to her mommy's new home in California. Sandy's grandmother, Meryl Laguna of Rockville Centre, said the cost isn't bad and the comfort of her pet is worth it. Flights start at 149-dollars and go up depending on the size of the animal and the distance. Right now Pet Airways services five cities: New York (out of Republic Airport), Baltimore, Chicago, Denver and Los Angeles. The company is looking to add more flights and cities soon. In the next three years, they hope to fly to 25 locations. The main cabin of a Beech 1900 aircraft (which usually carries 19 human passengers) has been customized to accommodate up to 50 pets. On board each flight is a "pet attendant" taking care of pets' needs. The creature-comfort airline started when a husband and wife got an idea. One trip from San Francisco to Florida for their Jack Russell terrier in a plane's cargo hold was enough to convince Alysa Binder and Dan Wiesel that owners needed a better option to get their pets from one city to another. That experience was stressful enough to spur Binder and Wiesel to start their own airline. "One time in cargo was enough for us," Binder said, walking through an airplane hangar as Zoe trotted in front of her. "We wanted to do something better." The couple used their consulting backgrounds and business savvy to start Pet Airways in 2005. The last four years have been spent designing their fleet of five planes according to new four-legged requirements, dealing with FAA regulations and setting up airport schedules. For owners, the big difference is service. Dogs and cats will fly in the main cabin of a Suburban Air Freight plane, retooled and lined with carriers in place of seats. Pets (about 50 on each flight) will be escorted to the plane by attendants that will check on the animals every 15 minutes during flight. The pets are also given pre-boarding walks and bathroom breaks. And at each of the five airports it serves, the company has created a "Pet Lounge" for future fliers to wait and sniff before flights. 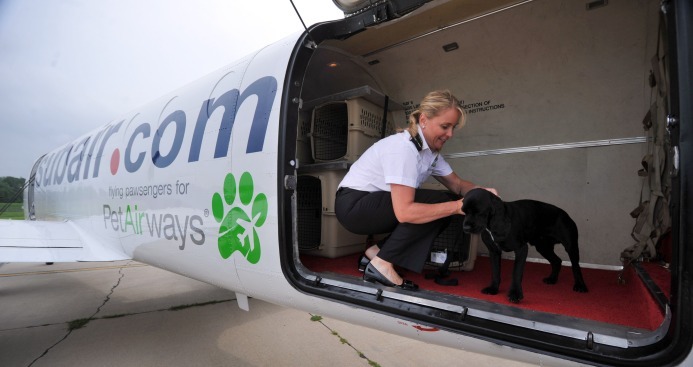 The company is operating out of smaller, regional airports in the five launch cities, which will mean an extra trip for most owners dropping off their pets if they are flying too. And stops in cities along the way means the pets will take longer to reach a destination than their owners. Hickey said the service was a welcome alternative to flying her dogs in cargo when she transplants them from her soon-to-be Denver home to Chicago to stay while she and her fiance travel to Aruba to get married. Anne Banas, executive editor of SmarterTravel.com, questions the viability of an airline with such a specific niche. But if you want your pet to fly aboard Pet Airways, you'll have to wait awhile. Flights for the first two months are sold out.